A free expansion for the bestselling action game Grand Theft Auto V developed by Rockstar North. The expansion introduces multiplayer mode based on the Internet network. The players can create their own avatars and together with friends explore the city of Los Santos. This is Grand Theft Auto V expansion pack. 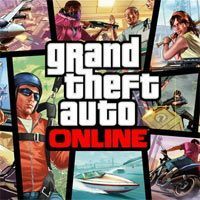 Grand Theft Auto Online is a multiplayer game that accompanies Grand Theft Auto V. The game lets players to play together in the world of GTA V. Rockstar Games Studios promised to continuously expand GTA Online with new elements. It may also be done by the players themselves, thanks to the in-game content creator. Grand Theft Auto Online leaves out the trio of GTA V main protagonists. Instead, you take on the role of a personally created gangster, whose appearance can be modified. You can freely explore the city of Los Santos and its surrounding areas and enjoy many attractions offered there. Up to 16 people can meet in a single world. Except the presence of multiplayer aspect, the gameplay mechanic is not much different from what you know from GTA V. Grand Theft Auto Online offers a range of jobs - such as bank robberies, assassinations, or body guarding - which can be done in a group. Just as in single player, some missions are given during cutscenes by characters with their own personality and voice. In addition to the free exploration and dedicated jobs, it is possible to join classic online modes, such as Deathmatch, or even create and share them with the GTA community. In addition, players can engage in various group activities, such as skydiving, golfing, racing, arm wrestling, and others. Players earn money in a way that is typical for the series – by doing jobs, gambling, stealing vehicles, etc. Traditionally, cash can be spent on elements of appearance (hairstyles, tattoos, outfits, etc.) and weapons, as well as vehicles and their modifications. You can also buy your own apartment, where you may invite your friends. In terms of graphics, Grand Theft Auto Online does not differ from what you could see in GTA V. Both games arrived on the market almost simultaneously and are based on the same content that uses Rockstar Advanced Game Engine, or RAGE. This guide to GTA Online answers all the most important questions regarding the first steps in the game. It contains description of character creation along with statistics determining their further development.